Thermal annealing is a standard method for bringing block copolymer films into their thermal equilibrium morphology. However, typical thermal annealing is slow, and polymers may degrade at high annealing temperature. Recently a group at Cornell University devised a scheme for ultrafast heating of polymer films using laser spike annealing . Alan Jacobs from Mike Thompson’s group and Clemens Liedel from Chris Ober’s group, both at the Department of Materials Science and Engineering, brought samples to CHESS D1 station for a detailed analysis of laser annealed traces. Beamline scientist Detlef Smilgies configured the beamline for microbeam GISAXS, providing a spatial resolution of 15 microns, at a small-angle scattering resolution of up to 40 nm . Figure 1a schematically shows the laser spike annealing procedure, where a focused laser beam from a 120 W infrared CO2 laser (λ=10.6 μm) is swept across the sample. The full width at half maximum of the laser trace is about ½ mm wide, and can thus be resolved spatially with the x-ray microbeam of 15 μm (Figure 1b). Within this profile the polymer film reaches different peak temperatures, and the sweeping speed determines the dwell time at a specific temperature. Hence a single laser spike annealed trace provides a cross section of the thermal history of the annealing process. Figure 1: (a) Laser spike annealing procedure and (b) microbeam GIXAXS characterization of the polymer film within an annealed trace. Peak temperatures in the laser trace were chosen to be close or above the order-disorder temperature of the block copolymer. With the laser system the polymer can be heated way past the temperature at which the polymer would decay if held at that temperature long enough. Goal is to outrun damage to the polymer by employing ultrafast heating and cooling rates. Another important point in the temperature profile is the point where the temperature surpasses the glass temperature of the polymer and polymer chains become mobile. Temperature profiles were carefully calibrated in the lab for different laser power levels and dwell times. Figure 2: Typical microbeam GISAXS image and intensity profile integrated over the dashed white rectangle and after background subtraction. The user team acquired close to 100,000 images on a fast Pilatus 200k detector corresponding to 3 sample materials with ~40 laser traces each. Jacobs developed software for automatic analysis of these traces; this involved background fitting and integrating the intensity of the first order peaks (see Figure 2). The peak intensity and width are indicators for the quality of ordering attained during laser spike annealing. Figure 3: Time-Temperature phase maps for moderate molecular weight (54 kg/mol) cylinder forming PS-b-PMMA polymer starting from (a) an initially well-ordered morphology and (b) initially disordered morphology. 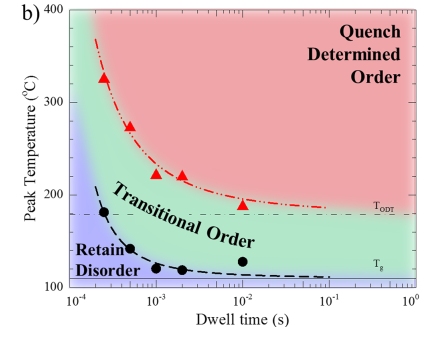 The study shows that both disordering (Figure 3a) and ordering (Figure 3b) can be kinetically suppressed at sub-millisecond timescales. Specifically, the initial starting state is retained to extreme temperatures as polymer motion is suppressed. Conversely, for material annealed at high temperature for long enough duration, the resultant morphology is purely quench determined. This knowledge allows better design of polymer annealing processes in applications such as directed self-assembly (DSA) and could open the door for block copolymer spatially templated chemistry using laser spike annealing. 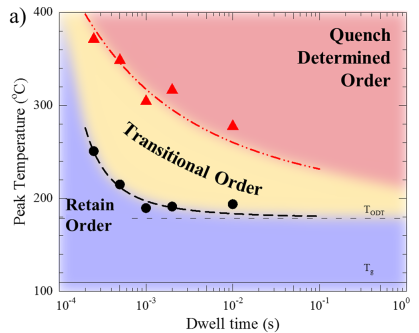 Alan G. Jacobs, Clemens Liedel, Hui Peng, Linxi Wang, Detlef-M. Smilgies, Christopher K. Ober, and Michael O. Thompson, Kinetics of Block Copolymer Phase Segregation during Sub-millisecond Transient Thermal Annealing, Macromolecules 49, 6462−6470 (2016). Ruipeng Li, Sterling Cornaby, Marleen Kamperman, and Detlef-M. Smilgies: "Nanocomposite Characterization on Multiple Length Scales Using μSAXS", J. Synchrotron Rad. 18, 697–701 (2011).